Here are some ideas we picked up on a site visit to the PhotoBox contact centre in London. Once every six to eight weeks, PhotoBox gather coaches together from their contact centres across Europe for “calibration sessions”. During these calibration sessions, coaches will discuss anything that they have encouraged advisors to do in their contact centre, which has improved quality scores, morale, job satisfaction etc. Not only is this a good method to improve customer service in the contact centre, as you are consistently providing coaches with ideas of how to get the most out of advisors, it also helps to provide consistent service across the business. This is particularly useful for PhotoBox, who can push calls out to their other contact centres across Europe to multilingual advisors, so the customer receives the same quality of service, no matter where they live on the continent. If a customer has sent three emails regarding the same query, PhotoBox encourages their frontline team to pick up the phone and call them. This may seem odd, as many contact centres stick to the customer’s preferred method of contact. However, by establishing a three-email rule, the company nips customer frustration, which stems from the effort it takes to keep responding to emails, in the bud. Also, by doing this, customer issues can be resolved in much faster. This means that the customer is not left with any prolonged doubts about your organisation, and your advisors can move on and handle queries from other customers. Whilst it is commonplace for customers to be sent Net Promoter surveys, PhotoBox also hands one out to each member of the contact centre team, and they act off the feedback given, to maintain happy and loyal employees. Using insight they have gained from the activity, the company has acted on a number of suggestions that they have received. 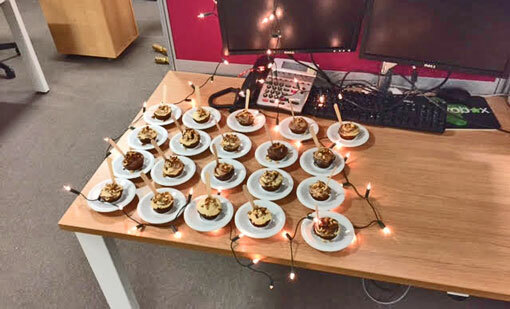 One example that they were keen to share was that they now take dietary requirements into account when providing snacks and beverages for advisors. Although this change may only be small, being just an extra couple of pounds to the shopping bill, the advisors appreciated the fact that management acted on their feedback, and that was recognised by many other staff members. The graph below shows how the results of PhotoBox’s internal NPS survey have progressed since it was launched in 2015. Another interesting point that PhotoBox found from their internal surveys was that advisors believed their previous bonus system had too great a focus on certain metrics. So the company asked advisors what they felt the bonus system should be based on. Whilst some of the suggestions were not feasible, PhotoBox did take some advisor input into consideration when designing their new and improved structure. This proved to be successful in boosting agent empowerment, as well as morale and productivity, as advisors were working towards goals that had greater significance to them. One change that has worked well for PhotoBox, over the past year or so, was to take emphasis away from quality analysis and instead put more into learning and development. Whilst the company do deem quality scores to be important, less focus was placed upon them and more time is now invested in coaching rather than analysing performance. This extra time has allowed the contact centre to run 1-2-1 coaching with each advisor on the floor at least once every two weeks, to make sure that advisors are being supported effectively. During 1-2-1 training sessions, coaches ask advisors to complete a C-SAT survey to score themselves on a recorded conversation, as will the coach and the customer beforehand. The aim of doing this is so advisors can gain a better understanding of how coaches would view an interaction and how the customer feels during one, so ideally the scores should all be fairly close. By encouraging this, PhotoBox are promoting a culture of self-learning, with advisors being more aware of how the customer is feeling in a certain circumstance so that they will have more of an idea of what to say. PhotoBox makes updates of team metric scores visible to everyone on the contact centre floor, to promote a team ethic and promote open conversation. However, they also provide each advisor with an online feed, which gives each individual live updates on how they are scoring for each metric individually. This again helps advisors to self-learn, as they can see the areas in which they need to improve and the areas that they are excelling in. So if advisors tried a new technique during a call, they can check their individual feed to view how it affected their quality scores. A big frustration for many contact centres is the relationship that they have with other departments in the business. This is particularly the case when it comes to the marketing and production departments, as the voice of the customer, which is harnessed in the contact centre, could be used for great benefit in these two areas. So PhotoBox have a spreadsheet that advisors can contribute to with general customer perceptions on changes to marketing schemes, prices and processes. This helps the marketing team to gain live feedback on the changes they put in place. Also, marketing use the spreadsheet to inform advisors of the changes before they go live, so the contact centre has time to be proactive and not reactive. Also, the company often allows advisors to spend some time with the production team so they can relay any consistent problems customers are having when it comes to design. For example, advisors noted that the handles of the cups on which photos were printed were often being damaged. They then relayed this information to production, who altered the design of the packaging to prevent the mishap happening again. Generally, PhotoBox allow new members of the contact centre team to handle two live webchats at a time, with that increasing to three for more senior advisors. However, webchats can be quiet, which means that often these advisors are underutilised. So advisors at PhotoBox can request additional webchats, with some enabled to take up to four at a time. By doing this, the company minimises queue time at the same time as empowering its advisors to take on more responsibility and boost productivity. Take a look inside PhotoBox’s contact centre! 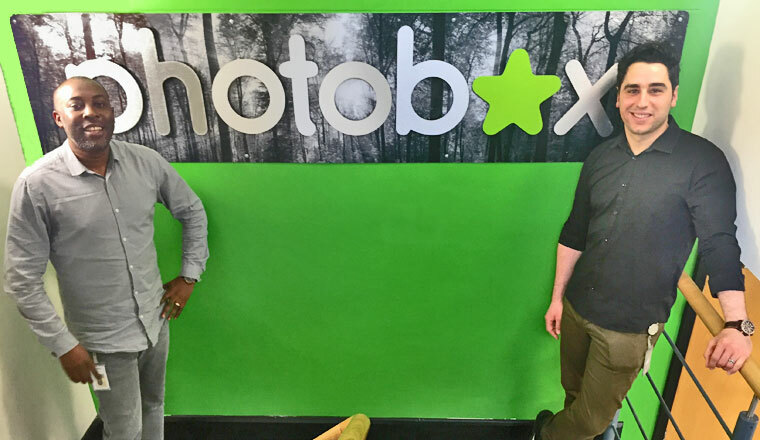 Advisors at PhotoBox’s contact centre have 1-2-1 coaching sessions once every fortnight, but those in charge of the schedule provide each individual with more time for negotiation training before peak times. Due to the nature of the company, its business will rise dramatically in the run-up to landmark occasions such as Christmas, Valentine’s Day and Mother’s/Father’s Day. But it is also important that negotiations remain consistent through the summer, so as not to confuse repeat callers. PhotoBox therefore makes sure that they support advisors correctly at these crucial times of the year, by planning useful training sessions and workshops accordingly. To guard against high staff turnover, it is important to build skills at advisor level, so members of the contact centre team feel prepared to go for internal promotion opportunities. 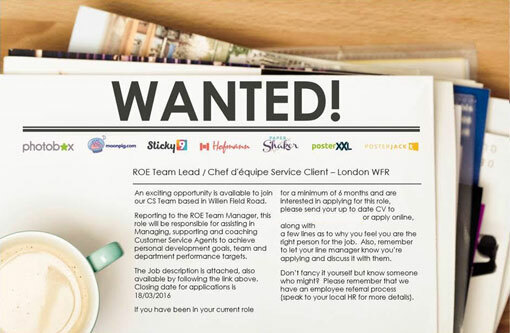 Whilst this aids morale, as it offers advisors the chance to enhance their skill set, it also helps to provide a sense of assurance that advisors can step up to the plate, as usually senior staff, including team leaders, in the contact centre are “grown” organically. Knowing this, PhotoBox offers BTECH courses in fields such as business management to senior advisors, as an investment in their future and to fill the knowledge gap in case a future opportunity arises. As mentioned in point eight, PhotoBox view it as important for advisors to have an understanding of the duties of its other departments, such as marketing and production, so their knowledge of the business translates to the customers. So, during low-contact periods, members of staff take a paid day out to visit other departments of the company, days that are known as immersion days. These immersion days are also beneficial for advisors, who may want to change to a different role within the business in the future to progress their career. This is because they can gain experience of what it is like to be in such a role, which can boost motivation to work for that position in the future. By making job openings visible around the contact centre, PhotoBox are highlighting the routes of progression that can be achieved for advisors. This helps to lower attrition, as advisors are more likely to believe that they have a long-term future at the company. It is also a great motivational tool and boosts morale, as advisors know that there is an opportunity to take on more responsibility and earn a higher salary. PhotoBox make sure advisors see these opportunities by sending them emails of job adverts within the company, which include graphics like the one above. 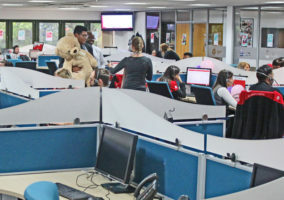 In the time after Christmas, when all the decorations had been taken down, the staff at PhotoBox’s contact centre noticed that there was an “empty feel” to their workplace. 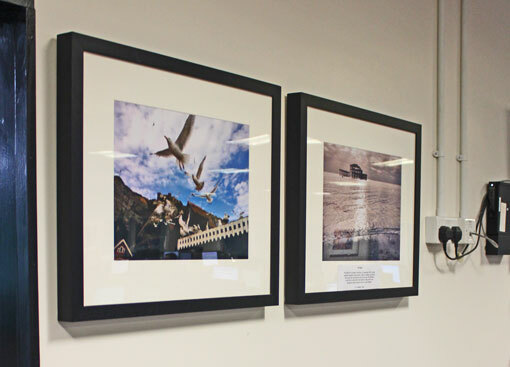 So, contact centre manager Abder Bounaaja decided to introduce photo exhibitions that would help to liven up the available wall space, whilst offering advisors the chance to get creative. This was very well received by advisors, many of whom already had an inherent interest in photography, as they had chosen to work for a photo-based company. Having one of their photos displayed around the contact centre also creates a positive memory for an advisor, and associating positive memories with the workplace can be a useful tool in boosting morale. Photos are collected, and then every six to eight weeks, Abder chooses his top ten. These top ten are expertly treated by the production team and framed, before being exhibited for six to eight weeks. After that time, they are taken down and given to advisors to keep before the next set is brought in. Having reward systems in place can provide motivation for an advisor to improve their personal performance, and PhotoBox have two monthly awards that they hand out to reward great performance. The first of the two awards is the “Make a Difference” award, which is based on a combination of multiple performance indicators, like C-SAT scores and team leader recommendations. The second is the “Shining Star” award, which is based on the same performance indicators, but is awarded to advisors who have been at the company for less than three months. This is to recognise potential and talent, whilst reassuring new recruits that they are doing well in their new position. The winners then receive prizes, which have in the past included televisions, speakers and headsets. The prize-giving takes place on the contact centre floor to remind all of the contact centre team that their hard work is being recognised and is appreciated, whilst calls are directed to other contact centres for that short period of time. 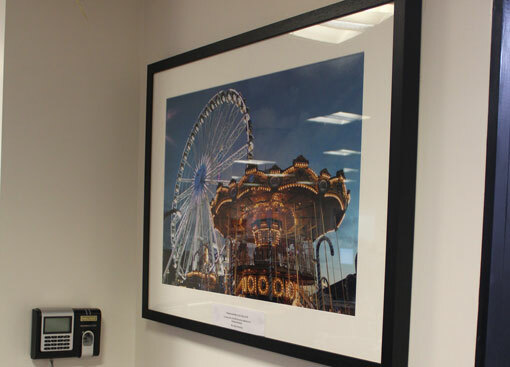 Alongside the monthly award scheme, PhotoBox offers more rewards during their busiest period. During this time, which is the six weeks before Christmas Day, the contact centre offers an additional award every week. This reward is given to the advisor who scores the best against a chosen metric that changes every week. Whilst this increases motivation when it is needed most, it also helps advisors self-learn, as they figure out what they can do to improve different aspects of their performance each week. Makeathon – This is a chance for advisors not only to get involved in the products PhotoBox delivers to its customers but also to work alongside design and marketing teams, for two – paid – days, to create a “mock-up” for a new product for PhotoBox to sell. Advisors are split into teams, where the best idea from each contact centre is pitched to the CEO and could one day become a real product that the company sells. Hackathon – This is a 24-hour spin-off of the Makeathon event, fuelled by pizza, drinks, prizes and… code. In this version, developers, designers, marketers, customer service and everyone with ideas at Photobox Group gets together to experiment and create cool working prototypes. 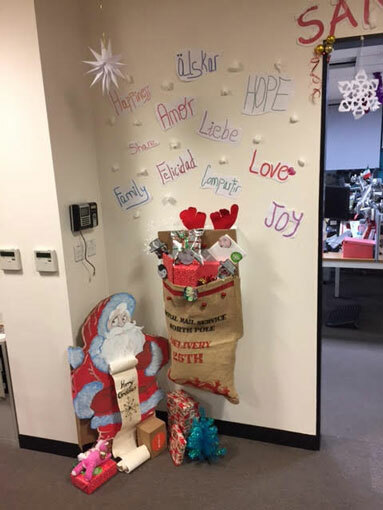 To improve advisor engagement over the busy Christmas period, PhotoBox run a floor decoration competition, where teams of 10–15 advisors compete to create the best and most creative decoration in their allotted space. Giving advisors the opportunity to take part in events such as this helps to nurture their creativity and rejuvenate their minds, replacing the repetitive aspect of the role with healthy competition. The winning team gets £300 to spend on a night out, which many choose to spend together, boosting the community aspect of the contact centre. 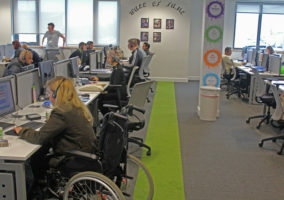 Thank you to PhotoBox for facilitating our visit to their London contact centre.